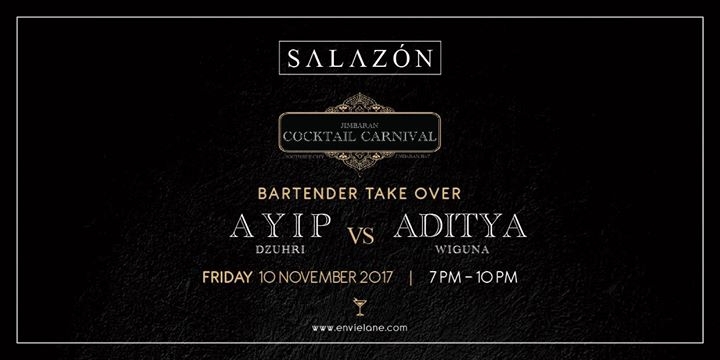 Salazon x Jimbaran Cocktail Carnival: Bartender Take Over! His name is Ayip Muhammad Dzuhri but since being named Indonesia’s Bartender of the Year, you can just call him the mix master. He earned his prestigious title at the Diageo World Class (DWC) 2015 Southeast Asian semi-finals in Thailand last month. A first-time entrant in the respected bartending competition, Ayip (above) can usually be found shaking cocktails at Sofitel Bali Nusa Dua Beach Resort. In September, he heads to South Africa to compete in the DWC Global Finals, alongside 24 bartenders from around the world. Alongside 8 years of extensive experience as bartender you can call him the Master Mixologist, Adit began his career as Jr.Bartender Jakarta then emigrated to Lux Resort & Hotels Maldives to moving on as flair bartender, uplifted his career to Embassy Club & Buddha Bar dubai to Hakassan Dubai as Bar Supervisor while he crowned a top 10 winners of Diageo Reserve World Class UAE Bartender of the Year 2015. Now Adit reside in the heart of Kayu Aya, Seminyak, together with influentitial team of Bartenders at Salazon, Bali. Book your seats before its stocked!